Ideal Scaffolding is one of the most leading manufacturers and exporters of aluminium scaffolding. Established in 2004, within a short span earned the glorious reputation through the standard quality control with the dedication of our expertise focusing on the durability, mobility and the safety of the products through the careful examination of the slandered quality during multiple applications. Ideal Scaffolding offers a variety of working platforms at various heights. All types of ladder frame towers, mobile towers, various platforms, foldable mobile scaffolding, etc are marked with durability, lightweightedness, mobility and effectiveness and also meet all the requirements of occupational safety regulation. 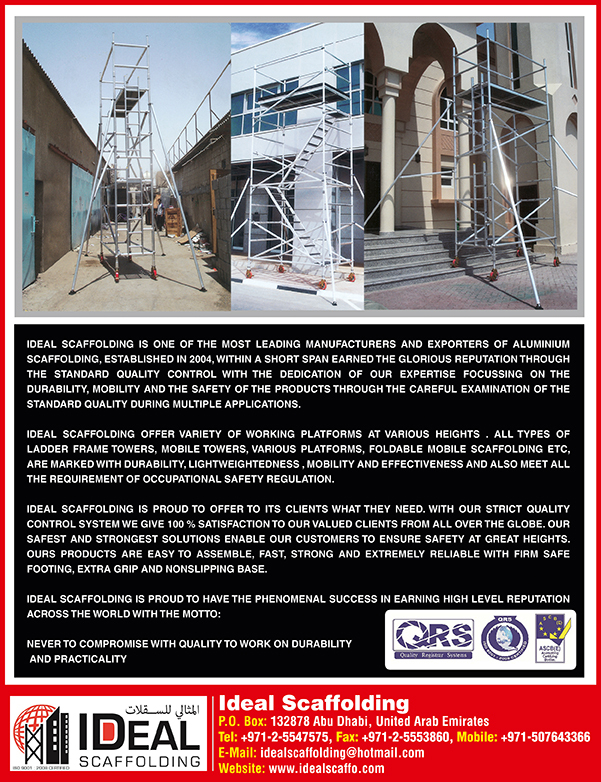 Ideal Scaffolding is proud to offer to its clients what they need. With our strict quality control system we give 100% satisfaction to our valued clients from all over the globe. Our safest and strongest solutions enable our customers to ensure safety at great heights. Our products are easy to assemble, fast, strong, and extremely reliable with firm, safe footing, extra grip non-slipping base. "Never to compromise with quality to work on durability and practicality"